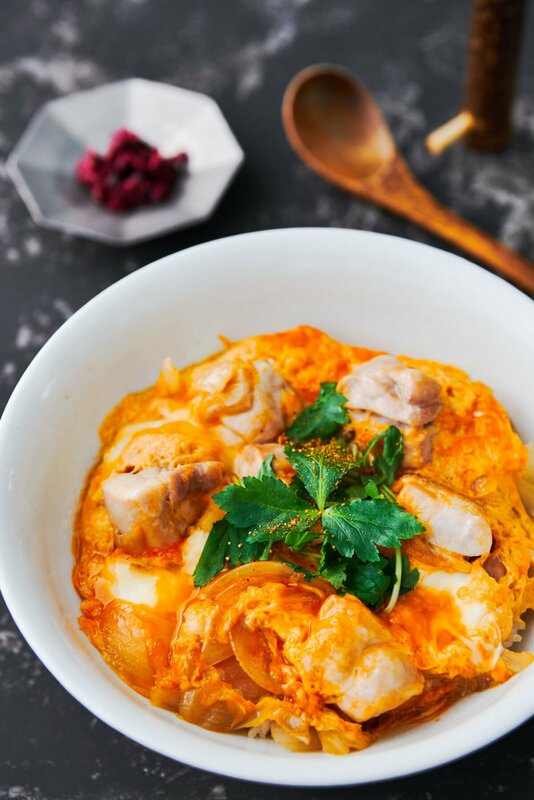 Oyakodon (親子丼) is a classic Japanese chicken and egg rice bowl, with tender pieces of chicken and sweet onions simmered in a sweet and savory dashi that's bound together with egg. It's a satisfying comfort food that's a staple of Japanese home cooking thanks to its simple preparation. 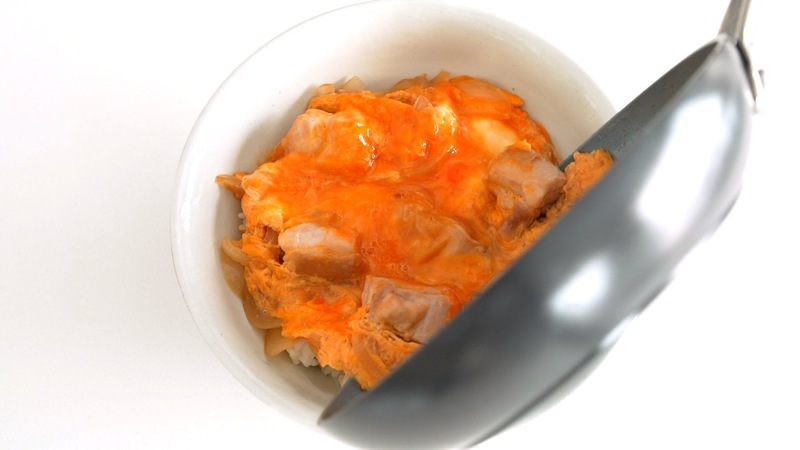 Oyakodon, is an abbreviation for Oyako Donburi (親子丼), which literally means “parent and child bowl,” alluding to the use of chicken and eggs together for this rice bowl. If you can get past the slightly morbid name, it’s a sublimely satisfying meal that comes together in just minutes. The word Donburi (丼) refers to a type of deep bowl used for serving food, but it also refers to a class of dishes served in the eponymous vessel. Donburis run the gamut from Gyudon (牛丼), to Katsudon (カツ丼), to Soborodon (そぼろ丼), but there is none more famous than the humble Oyakodon. It’s a comfort food staple that reminds most Japanese people of their mother’s home cooking. I know I harp on about the importance of using quality ingredients, but it’s especially true for simple dishes like this. As the headline ingredient, you want to try and use the best chicken available to you. In particular, you ideally want to use fresh chicken that hasn’t been frozen. That’s because freezing chicken alters the structure of the meat. Ice crystals that form as the chicken freezes pierce the cells, causing the juices to run out as the chicken cooks. 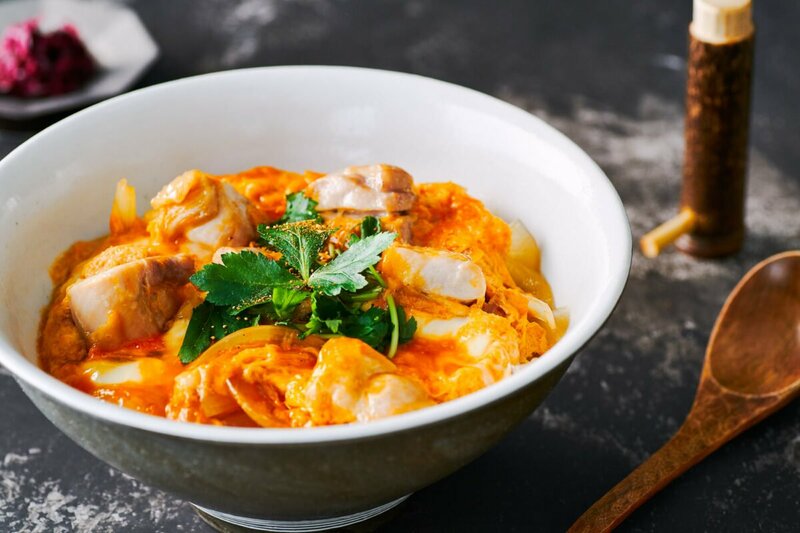 By using fresh chicken, you’ll end up with plump chunks of meat that burst with savory juices as you bite into them. Oyakodon is typically prepared using skin-on thigh meat because it’s juicier and more flavorful than breast meat. 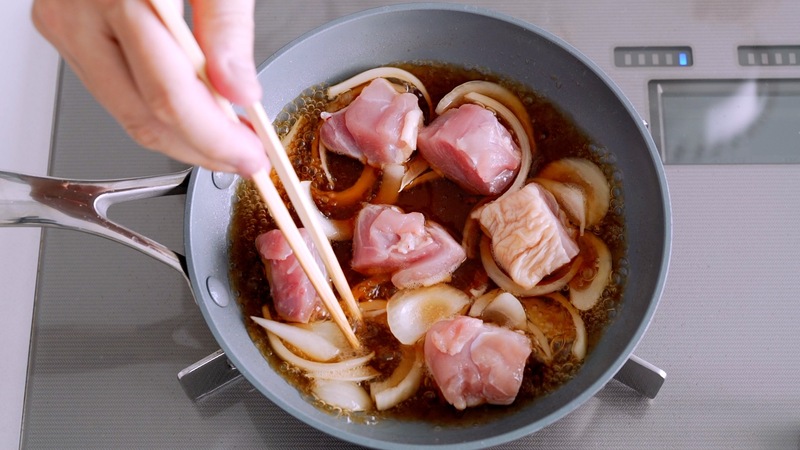 The skin not only helps keep the meat moist, but it also contributes some fat to the sauce, which in turn seasons the rice. If you do end up using breast meat, you’ll want to cook it for a shorter amount of time, so that it doesn’t end up tough and dry. Finally, if you really want to go all out, go for a locally raised heritage breed of chicken as these tend to be more flavorful than your garden variety broilers. You want to use very fresh eggs, from a producer you trust for this dish because the eggs aren’t fully cooked. In Japan, it’s fairly common to eat eggs raw, and the eggs for Oyakodon are usually only partially cooked with a fluffy bottom layer and a custardy top layer that’s still a bit runny. 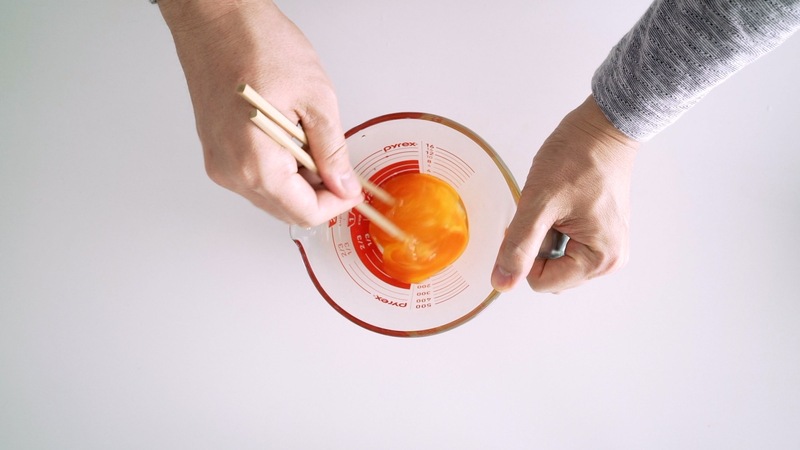 In some cases, these rice bowls are even topped with a raw egg yolk. I realize the eggs in some countries aren’t as safe as the ones in Japan, so if you’re concerned about this, please cook the egg all the way through. As for the type of egg, I like using extra large eggs with a big golden orange yolk. Although the color of the yolk doesn’t make a huge difference in the taste, it does reflect the diet of the chicken, and a vibrant egg just looks much more appealing in this dish, than a ghostly yellow egg. If you can get your hands on them, sweet onions work great here as they’re not only sweeter, they also tend to be more tender. If you can’t find them, then regular yellow onions will work just fine. The sauce for Oyako Donburi is a sweet and savory mix of Japanese dashi stock seasoned with soy sauce, sake, and a bit of sugar. I usually keep a bottle of smoky umami-rich home-made dashi on hand to make short work of dishes like this, but you could also make this using chicken stock or vegetable stock in a pinch. The original Oyakodon was likely ungarnished, but I’m a firm believer that we eat with our eye first, which is why I like adding a splash of green. The most common garnish in Japan is Mitsuba, which is an aquatic herb that has a refreshing cedar-like fragrance that’s a nice compliment to the rich chicken and egg. It can be a little hard to find outside of Japanese grocery stores, which is why I encourage you to get a little creative here. Watercress is probably the closest to Mitsuba in terms of taste, and I’ve also garnished this donburi using other greens such as scallions, chives or even peas. I also like to serve Oyakodon with a sprinkle of shichimi togarashi (七味唐辛子 – seven-taste chili), a delightful Japanese chili blend. Shichimi not only provides a spicy kick, but it also contributes a wonderfully fragrant aroma thanks to aromatic ingredients such as sesame seeds, hemp seeds, nori, yuzu, and sansho. 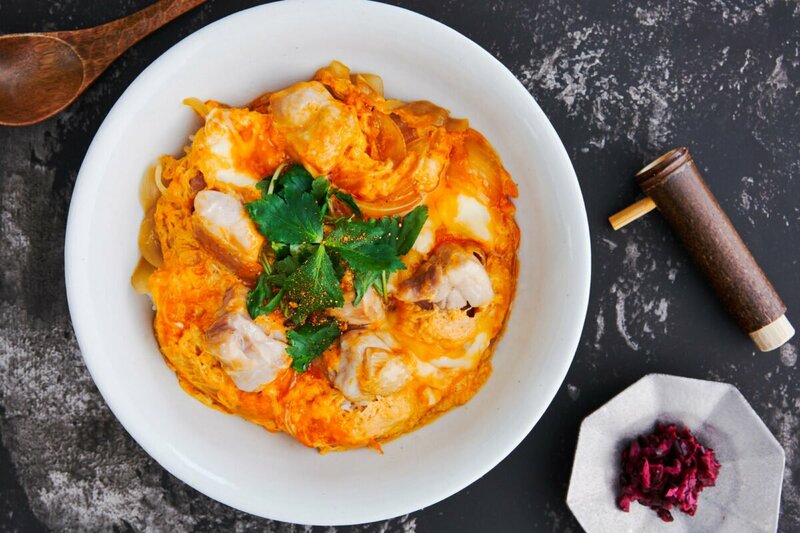 Oyakodon is a delicious and satisfying chicken and egg rice bowl that’s a staple of Japanese home cooking. Oyakodon is one of those dishes that’s made in about as many ways as there are cooks who prepare it. I’ve tried many of the methods, and for me, the technique below yields the best results. I start off by boiling the onions in dashi seasoned with a bit of sake, soy sauce, and sugar. This not only gives the onions a head start, but it also gives the alcohol in the sake a chance to burn off. Then the chicken goes in, and the heat gets turned down a bit to maintain a gentle simmer. 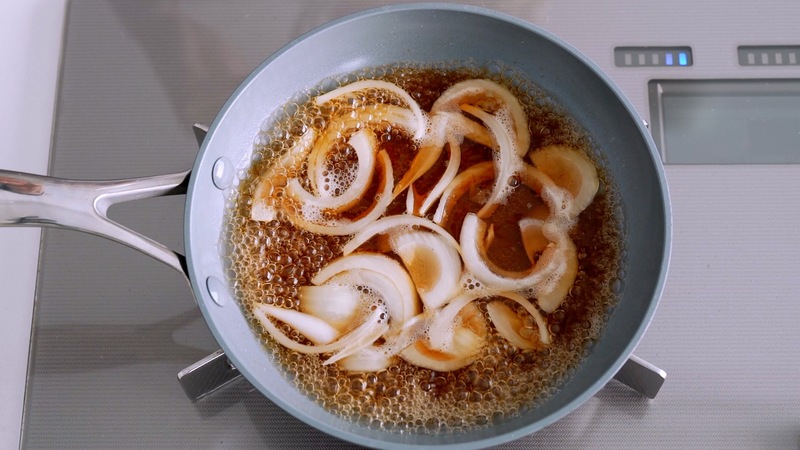 While browning the chicken in oil may produce more flavor, I prefer this poaching method because it keeps the chicken nice and tender. Because we’re cooking it in a broth, there’s no shortage of flavor. The egg goes in at the very end, binding everything together while adding body to the broth. I like my egg quite rare, which is why I cover the pan and turn off the heat, which provides just enough residual heat to cook the bottom layer of egg while leaving the top layer custardy and a bit runny. If you want to cook your egg all the way through, just cover it and leave the heat on low, until the egg is cooked to your liking. To finish the Oyakodon off, slide the chicken and egg onto a bowl of steaming hot rice and garnish it for a colorful lunch-in-a-bowl that’s soul-satisfyingly good. 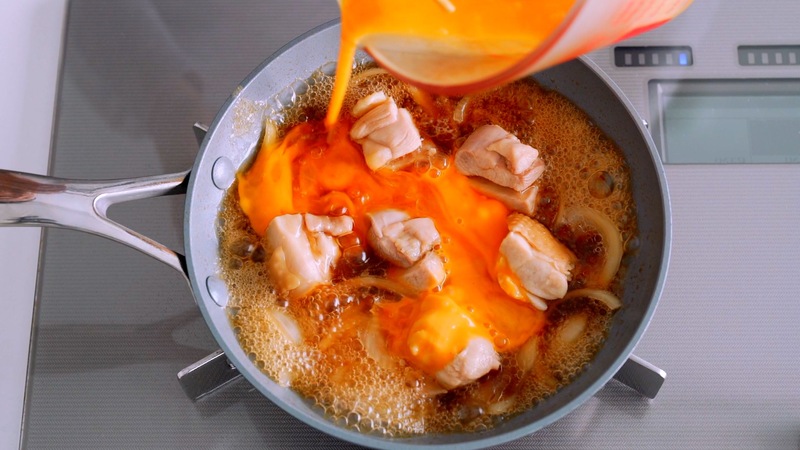 With big chunks of plump, juicy chicken that are barely held together with creamy egg infused dashi, each bite is a revelation on how a few simple ingredients can be so delicious when put together in the right way. Whisk the eggs in a container with a spout until they're about half mixed, but there are still some areas with pure egg white and egg yolk. 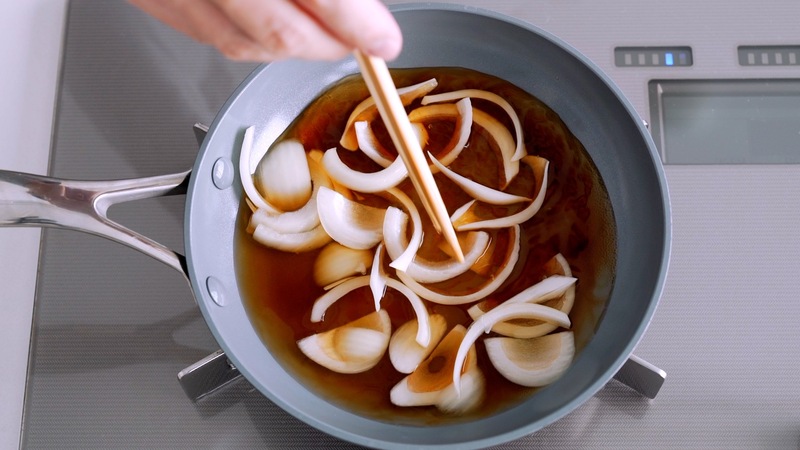 In a small frying pan, about the diameter of the bowl you plan to serve your Oyakodon in, add the dashi, sake, soy sauce, sugar, and onions, breaking up any clumps of onion as you add them. Bring the stock and onions to a boil and continue to cook until the onions are starting to turn translucent. Add the chicken and turn down the heat to maintain a gentle simmer. Cook, turning the chicken over regularly until the surface is opaque, and then cover with a lid and cook until the chicken is cooked through (another 4-5 minutes). Remove the lid and turn up the heat to bring the mixture to a boil. 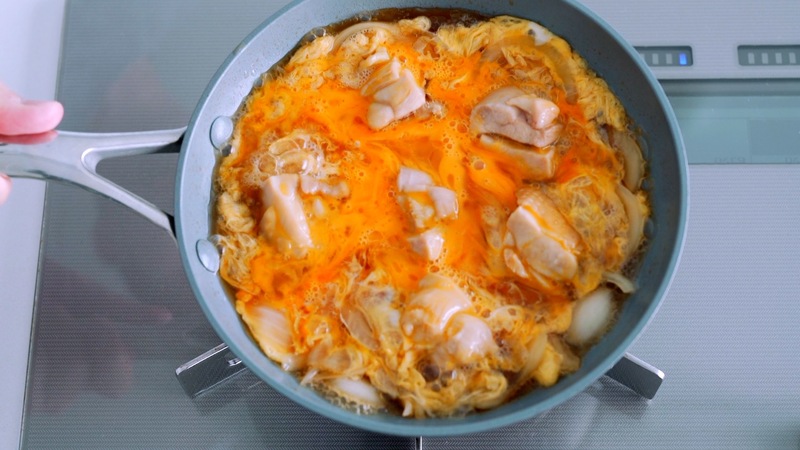 Drizzle the egg over the chicken in a figure eight pattern to ensure it's evenly distributed. Smack the bottom of the pan against the burner a few times to redistribute the eggs. 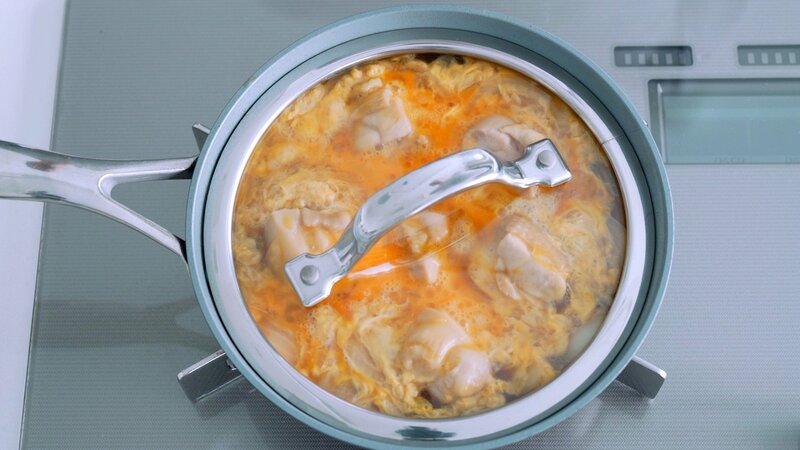 Cover the pan with a lid and turn off the heat and let the egg steam while you serve the rice. Add one serving of rice to a large bowl while the egg steams. When the egg is cooked to your liking, slide the chicken and egg onto the rice. Garnish your Oyakodon with scallions or Mitsuba and shichimi togarashi to taste. Looks so healthy & yummy! Glad to hear you enjoyed it! Thanks for stopping by to let me know! If you enjoyed watching this, please let me know by heading to my YouTube Channel and giving this a like👍🏽, Subscribing to my channel, and leaving a comment to let me know what you think. These videos take a ton of time to produce and hearing from you is the best motivation to keep me going.